Reuters won two Pulitzer Prizes on Monday, one of the Buddhist villagers and 10 Muslims of Myanmar's security forces to publish the massacre of Rohingya and another for America's immigrants in the United States shelter center. This award marks the second year in a row that Reuters won two politters, the most prestigious award of American journalism. Reuters has won seven since 2008. 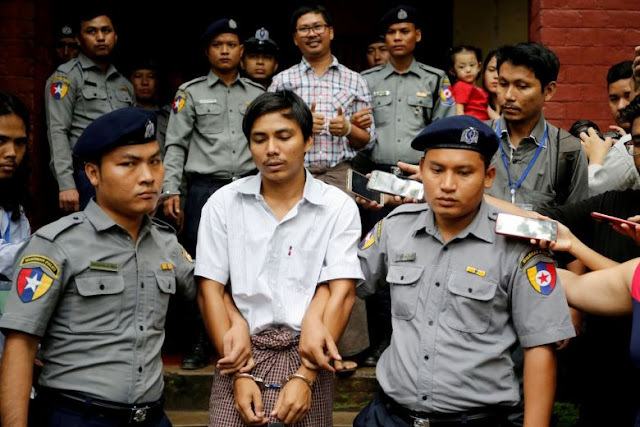 Two years of honors for their role in exposing the murders of Myanmar for 490 days have been sent to jail. "Despite being recognized for this work, we should give attention to the people, whom we mention in our report: In this case Rohingya and Central American immigrants," Reuters Editor-Chief-Chief Stephen J. Adler said. Other sections include a special mention in the US Genocide and the investigation of US President Donald Tram. Both the New York Times and the Washington Post each have two pools. Both the Reuters and Associated Press were rewarded for international reporting as soon as the AP won in Yemen in the wake of war wars. The Reuters Prize was for an investigative report, which published 10 Rohingya genocide in In Din Din village in the interim area of ​​Rakhine state. Two young Reuters journalists, Myanmar citizen's both YL Lawn and Q. Soo, the mass of bones trapped in the ground are buried in the grave. They went to collect evidence from criminals, witnesses and victim families. They got three devastating photographs from the villagers: two Rohingya men tied and kneeling; The third showed the explosives and bulleted bodies of the same 10 men of the same shallow grave. In December of December, Wah Lone and QSO also criticized the authorities' efforts to block the report of international observers before they could finish their story. The report "The Genocide of Myanmar" ended with colleague Simon Lewis and Antony Soldkowski and was published in February of last year. In September, Y Lone and Q Suu Wook were sentenced to seven years in prison for violating the official secret act of the country. Adler said, "I'm glad that WLL and QSO and their colleagues have recognized their awesome, brave coverage and our photojournalists for their ongoing picture, which hinders the huge obstacles against humanity." "I am deeply troubled, but our brave journalist WL Law and QoOo are still behind bars." In the breaking news photography category, 11 Reuters photographer contributed to the picture in the film "On Migrant Tril to America", a package of pictures shows shelter-seekers and other immigrants from Central America on the US border. An image of Kim King-Huner showed immigrants carrying tear gas in Mexico at the San Diego-Tijuana border in the US authorities. In the film, a mother wore her daughter of two daughters, one of the diapers and rubber sandals, the other barefoot, a tires cannister emits smoke. In another film, the first person to photograph the capture facility of Mike Black Tornillo, Texas, an aerial photo, where the child was walking like a prisoner in a single file. Garan Tomashevich Sir Pedro Sula, Honduras, has been caught in a picture of a beef drilling near a corpse of 18 gang members in Briere, a city in the world's highest killing rate. Tomasic was the last winner for the war picture in Syria. New York Times Trump has given a financial statement and interpretation of tax avoidance reports and another award for editorial writing of Brent Staples. The Washington Post's Lorenzo Tugnoli won the Photography Photography Award for Yemen's Famine, and the newspaper Carlos Lojad won for criticism. During his campaign during the Wall Street Journal, two women won the National Report Award to uncover trams of trams, who claimed to work with him. US mass media massacre was recognized four times. The Pulitzer Board says the South Florida Sun-Sentinel Public Service Award for failure to publish by the school and law enforcement officials before and after firing a serious fire at Marjorie Stoneman Douglas High School. In February 14, 2012, 17 people were killed in mass killing in Parkland, Florida. Pittsburgh post-gazette staff won the Breaking News Award for "Immersive, Gracious" coverage of the Pittsburgh Tree of Life Synagogue's massacre coverage, which killed 11 people on October 27, 2018. Pulitzer Administrator Dana Kennedy, after announcing the winners, praised a non-winner: Marzary Stoneman Douglas High School for her coverage for the murder of Eagle Eye Student newspaper staff. The Pulitzer Board also provided a special quote in the Capital of Annapolis, Maryland, "Their brave response to the biggest killing of journalists in US history in their newsroom". A gunman shot five people on 28 June, 018.